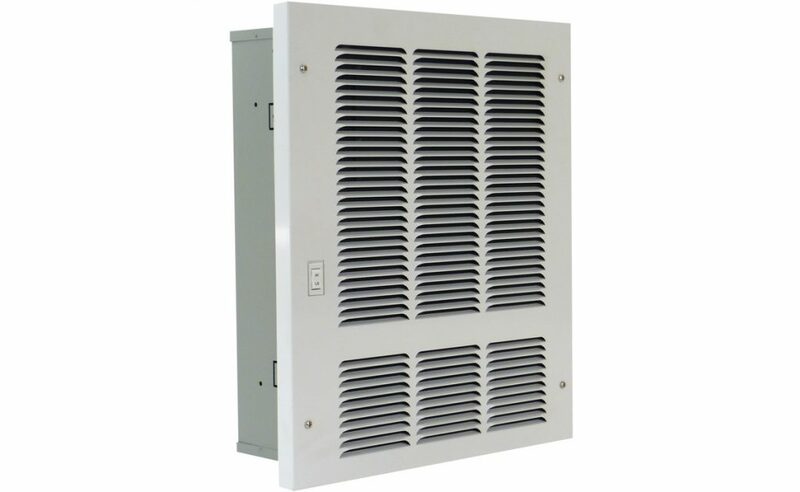 King’s HM / MHE Series medium hydronic heater uses the energy from a building’s existing hot water source to offer efficient, whisper quiet operation and the ability to reduce utility bills with individual room control. By installing hydronic heaters in every room, you can easily heat only the areas in use and conserve energy. 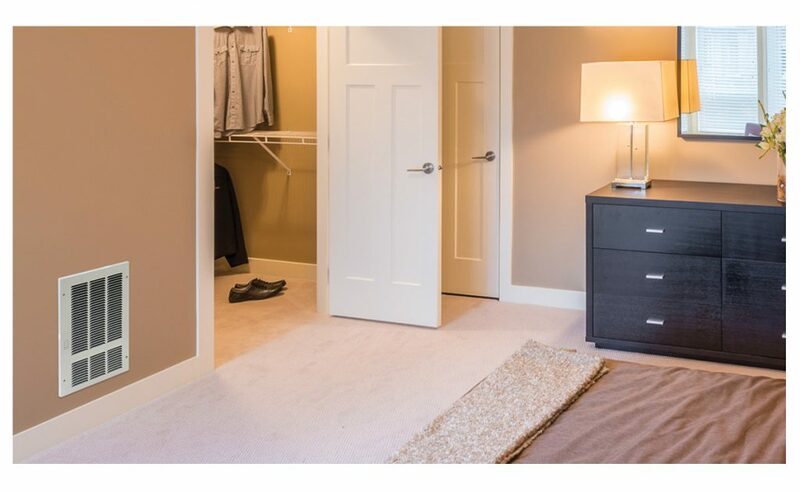 Designed to fit neatly between standard wall studs, this in-wall heater provides out of the way positioning ideal for use in bedrooms, bathrooms, and laundry rooms. For use in both residential and commercial applications. 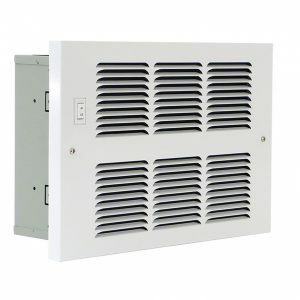 Provides 4960 to 18,700 Btu heat output. Hydronic heaters use hot water from home’s hot water tank and gently recirculates heat throughout the room. Heat only the rooms which need it, borrowing energy from what’s already here: the hot water heater. 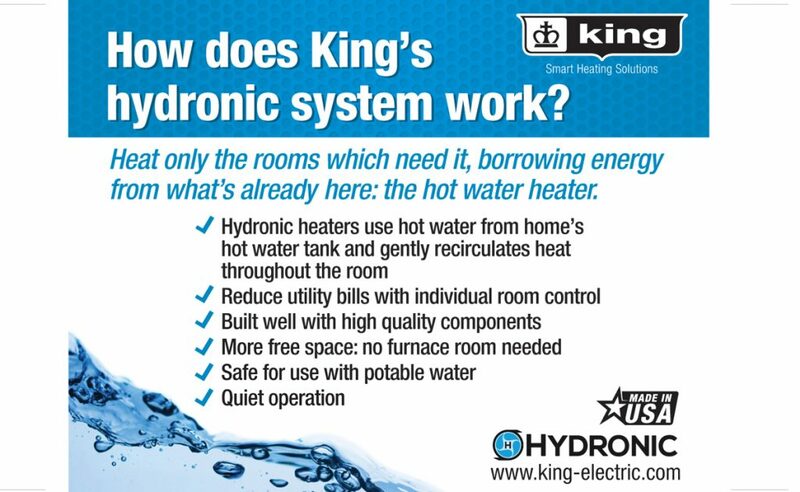 King’s hydronic system offers cost-saving zone control, heat source sharing, near silent operation, quality construction, and easy installation. * most common water temperature range. Coils are made of copper alloy 122 manufactured to ATSM B-75 specifications. Brazing alloy is AWS-BCUP2 for use with potable water systems. Electrical circuit size: 15 amp maximum. BTU ratings based on 68˚ entering air. To calculate 1 GPM, multiply by 0.95. To calculate 4 GPM, multiply by 1.05. 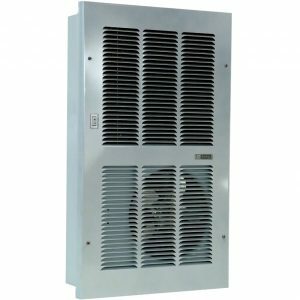 Contractor shall supply and install HM/HME Series hydronic fan heaters manufactured by King Electrical Mfg. Co., Seattle, Washington. Motor: 2 speed shaded pole impedance protected. Permanently lubricated. Bronze bearings. Blower: Tangential blower to provide 150-375 CFM of air. Quiet operation of less than 53 dB A weighted scale at high speed. Easily removed for service. Bronze, not plastic, bearings. Coils: 1/2″ OD Copper tubes with Aluminum fins of no more than 4 fins per inch for free flow of air and maximum circulation of air and water. Tested at 300 PSI for leaks. Bleed valve to purge air. Copper tube used in coils is Alloy 122 made to ASTM B-75 specifications. Grill: 20 gauge mild Steel, louvered with Nickel-plated grille screws. Powder-coated in white. Wall Can: 20 gauge mild Steel, electro-galvanized to resist corrosion. 1/2″ knockout in bottom of can and QuickSetTM bend out mounting tabs for fast installation. Fan Switch: 3 position fan switch High / Off / Low. Rated at 10 Amps with wire leads and insulated 1⁄4″ quick connects. Terminal Board: All electrical connections will terminate at a phenolic terminal board with 1⁄4″ male brass blades for easy wiring. Water Connections: 1/2″ bare Copper tubes de-burred. Tested at 300 PSI for leaks. Clean out tubes for water connection. 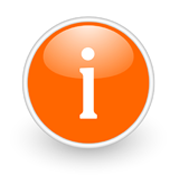 Approvals: ETL (3131491PRT-001). All King heaters are tested to UL 1995 Standards. Approved for USA and Canada. CSA/C22.2. 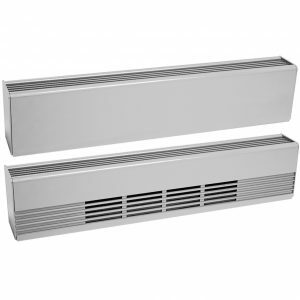 Fan driven hydronic heater for use with hot water from any energy source. The small size and quiet operation make it perfect for bedrooms. Fan driven Hydronic toe-space unit for kitchen and under-cabinet applications. Fan driven hydronic heater for use with hot water from any energy source. 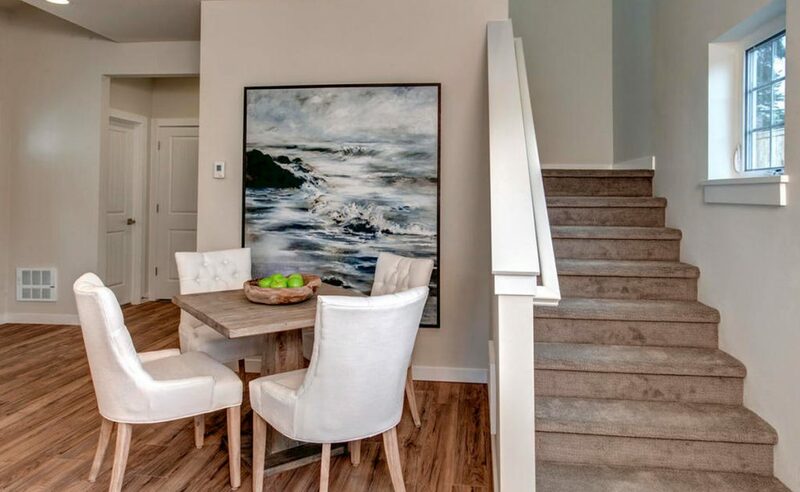 The large size and quiet operation make it perfect for larger living spaces. No drafts no cold spots. 5" high x 3" wide. 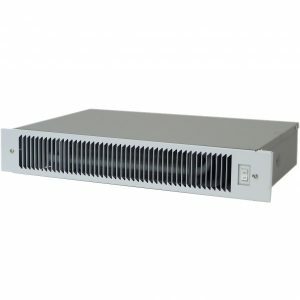 It is ideal for residential, apartment and commercial applications. Custom lengths available.